Here's an interesting rock! One example of it has the hint of lace structure like Lace Agate, another has orbs like Ocean Jasper. 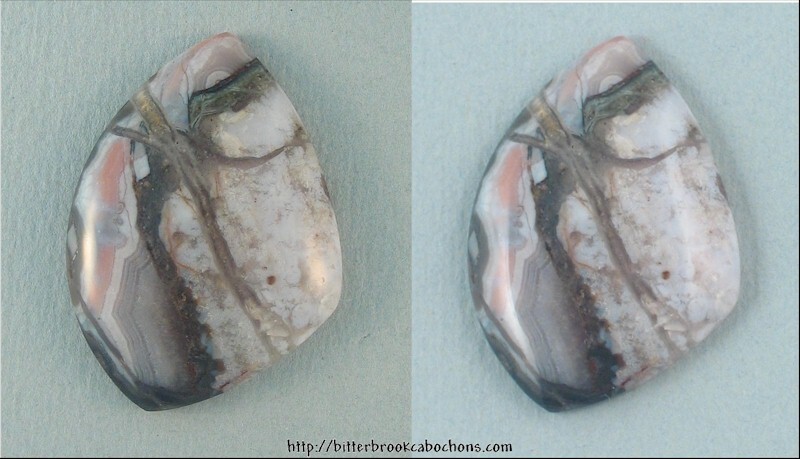 This one has a gray material separating pinkish lacy areas from a milky matrix, and a big, almost translucent fracture (which has naturally healed) right through most of the cabochon. VERY interesting! The surface of this cab has numerous tiny pits in it (looked like surface crazing), so I stabilized it and gave it a coating of super glue. This allowed me to give it a better polish. Dimensions: 35mm x 25mm x 6mm. Weight: 36.70 carats. Click here to go back to the main view of this cabochon.